How Are U.N. Climate Talks Like A Middle School? Cliques Rule Tiny island nations, Latin American developing countries and even non-joiners like Switzerland have all found more power and influence in climate negotiations after forming or joining a group. 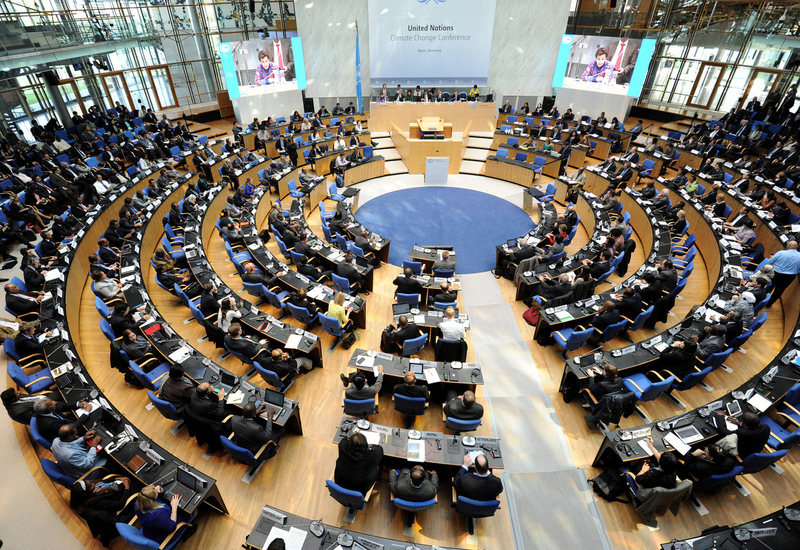 Delegates took their seats during the plenary session at the Bonn climate change conference on March 10, 2014. Negotiations resume this week; by the end of the year, the U.N. hopes to have forged a new global agreement. It seems to be part of human nature to want to belong to a group. People constantly form groups, in all kinds of situations, and high-stakes negotiations on climate change are no exception. Delegates from nearly 200 countries are meeting in Bonn, Germany, this week to resume negotiations on a new global agreement to cut greenhouse gas emissions — it's part of the runup to a major summit in Paris later this year. And the countries negotiate in groups, some of which are a little puzzling. "At last count, I believe there are now 14 groups," says Elliot Diringer, executive vice president of the nonprofit Center for Climate and Energy Solutions. "It might take you back to junior high school and cliques, which can be very powerful forces actually." By the end of this year, the United Nations hopes to have forged a new global agreement that will affect everything from energy production to agriculture to transportation. So it makes sense for countries with shared interests to negotiate in packs. "Members of groups coordinate their positions because there's a strength in numbers," says Diringer. "They also serve as a bit of a support system, particularly for smaller countries." Diringer has been watching U.N. climate negotiations for two decades. In the early days, he says, there were just a few groups. For example, members of the European Union have always negotiated together. "You then saw the emergence of the Umbrella Group, which is basically the developed countries that are not within the European Union," he explains. The group includes Australia, Canada, Japan, New Zealand, Kazakhstan, Norway, the Russian Federation, Ukraine and the United States. Where did the name come from? No one could tell me. But one diplomat jokingly told me it was because an umbrella is a good hiding place. "These are guys who wanted to do as little as possible. And so they found a shade for themselves," jokes Nozipho Mxakato-Diseko, an ambassador from South Africa. "Canada's got its oil from tar sands, you know. Where better do you go? You go to the Umbrella Group, to hide." Now that the U.S. has started talking big about taking action on climate change, she says, "I think there's a curiosity as to what's going to happen to the Umbrella Group." Her country, South Africa, is currently chair of the largest group in the negotiations. It's called the Group of 77 and China. The name is left over from when the group first formed; now it includes a lot more countries. "It's 134 in all," says Mxakato-Diseko. Its members are developing countries — including Afghanistan, Botswana and Vietnam. Mxakato-Diseko characterizes the members as "countries that come to this process with an understanding of what climate change is because they feel the impact most immediately — and have been feeling the impact for quite a while now." But that doesn't mean everybody in that group sees things exactly the same way. "The most significant change we've seen in groups over the years is the emergence of smaller groups of developing countries," says Diringer. If you're a tiny island state and feel that your very existence is threatened by melting ice and rising seas, he says, "at a certain point you realize that your interests may not be the same as those of a major emitting country like China or India." It's now common for a member of the Group of 77 to also belong to another group. Sometimes the name of the group gives you a clue about the common interests, such as the Coalition for Rainforest Nations or the Mountainous Landlocked Developing Countries or the Alliance of Small Island States. Other times, the name is less revealing. For example, the Like-Minded Group of Developing Countries includes nations like Saudi Arabia, Bolivia and Venezuela. What are they like-minded about? Diringer says they're seen as the hard-liners. "They, generally speaking, hew very closely to the traditional developing country view that there should be very stark differentiation between the obligations of developed and developing countries," he explains. Meanwhile, other developing nations say they'll take action on their own, without waiting around for richer countries. Some of them formed a group called the Independent Association of Latin America and the Caribbean. "So you've seen, to some degree, a splintering of the developing countries," Diringer says. "And on the whole I actually think that's healthy. Because if everyone sticks to group positions and feels constrained by those group positions, it can be hard to make progress." And then, there's the group that was started by Switzerland. About 15 years ago, famously neutral Switzerland wasn't part of any group. Franz Perrez, Switzerland's chief negotiator on climate change issues, says the Swiss isolation became a problem when, at one point in the climate talks, the leaders of key groups went to a private room to negotiate. Perrez says his predecessor tried to join the discussion, "but was escorted out of the room by security because he was not representing a group." The very next day, he says, Switzerland announced it was forming its own group "and that any country who doesn't have a home is welcome to join that group." Switzerland ended up banding together with Mexico, South Korea, Lichtenstein and Monaco. This unlikely team is called the Environmental Integrity Group. Roberto Dondisch, Mexico's lead climate change negotiator, says this group is really influential because its members are so different from each other, and cross so many divides. Both developed and developing countries seem to think, well, if those guys can agree on something, maybe we should take a look. "You know if we can get Mexico and Switzerland and Korea to share the same points," says Dondisch, "you have a pretty good shot that, that document could be adopted by almost everybody in the room." And that is the ultimate goal of the meetings in Bonn and Paris — to put forward a plan to battle climate change that virtually every nation in the world can sign on to. For that to happen, all these different groups will have to somehow come together and become one.